Micron's pigment based ink is archival quality, chemically stable, waterproof, and fade resistant. Used by heirloom quilters and decorative fabric artists. 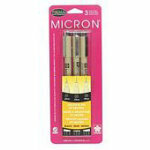 Set includes 3 pens sized: 01 .25mm, 03 .35mm 05 .45mm. Black Ink.